Chambered! Love yer new avatar! Why thank you Stovey .....can ya guess what cartridge it is ??? Be careful. I'm not from Phaaay state. I don't swing like that. really hard to get close around here too..........YEAH RIGHT!!!! Oh God rub it in mate! hahahaha....round 3 tomorrow! Elvira needs to speak! BTW- that is a VERY cool looking bird. What the heck is it? Mr. Shea butter soap-on-a-rope and potpourri scented boot insoles. According to the label on the pic it's a Blond Pheasant mate. A nice looking bird that would look even better on the table. .....ooops! Doh! Just call me Cpt. Oblivious! 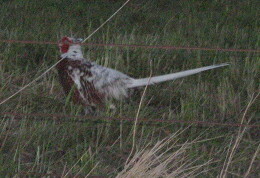 tis a mutant ringneck pheasant...normally see them darker than the golden red...right through to blue/black. this fella is the only one Ive ever seen in this colouring. [quote="stovepipe"]Oh God rub it in mate! hahahaha....round 3 tomorrow! Elvira needs to speak! well????? howd ya get on????? managed another bunny today out with the kids. dog worked like a demon in the heat...poor wee hua was panting like a steam locy. Question: are the blond pheasants also a little easier to get? Probably Aloys...and I bet they have a wilder time as well mate. stovey, maybe you'll have more success this way. Ouch, you are cold blooded Slim.